Here's How The Oil Industry Is Influencing Science Lessons In Public Schools Oklahoma's oil industry is spending millions on science lessons for public schools. But environmentalists say omitting climate change leaves students unprepared. Teachers gathered at Choctaw High School for a workshop by the Oklahoma Energy Resource Board, where they were taught pro-energy science lessons to bring back to their students. It's a Saturday at Choctaw High School, but for hundreds of Oklahoma teachers, there's a training class in session. 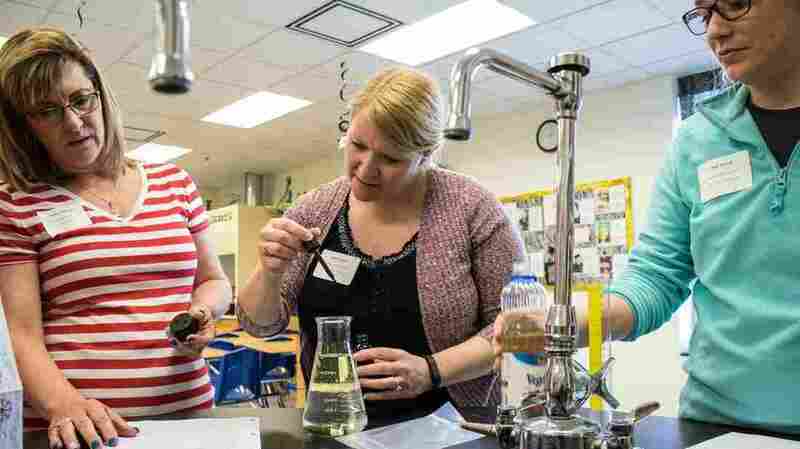 Carrie Miller-DeBoer perches atop a stool monitoring a pair of soda bottles linked with a small length of thin plastic tubing created to mimic enhanced oil recovery, while teaching chemistry fundamentals. "I love it and my students will be so excited," she says. This story was reported in partnership with the Center for Public Integrity, an investigative news organization, and StateImpact Oklahoma, a collaboration of local NPR member stations. Continue reading more from the investigation here. DeBoer is among 14,000 teachers in Oklahoma being trained to instruct a K through 12 education curriculum funded by the oil and gas industry. The lesson plans, created by the Oklahoma Energy Resources Board, have been used in Kansas, and the overall model has been pitched to at least five other states. The program centers on teaching math and science through oil-centric lessons and labs. That includes things like calculating the mileage of tanker trucks, or the slope of pipelines. "Half of our budget is restoration, half is education," says Dara McBee, communications director with the Oklahoma Energy Resources Board. Since the 1990s, the energy board – funded by oil and gas taxes – has spent $40 million on the education program. But an investigation by the Center for Public Integrity and StateImpact Oklahoma, a collaboration of local NPR member stations, reveals there's a blurry line between industry promotion and education. Documents show educators had some role in creating the plans, but it's unclear how the lessons are written and updated each year. The board's education director does not have a background in education or science. Charles Anderson, a professor at Michigan State University who studies environmental literacy and develops curricula, says the Oklahoma lessons are blatantly pro-energy, but do not appear to deliberately distort science. "I give them credit for basically being honest," he says. But, he says, the board's pro-industry agenda is only telling "half the story" by omitting global issues like climate change. "The children of Oklahoma are getting a raw deal — they are getting educationally ineffective materials teaching content that will be of little use to them if they want to leave the state," he says. Representatives from the local chapter of the Sierra Club say they have met with the state's Energy and Environment Secretary to ask if the state will include lessons about climate change and renewable energy. 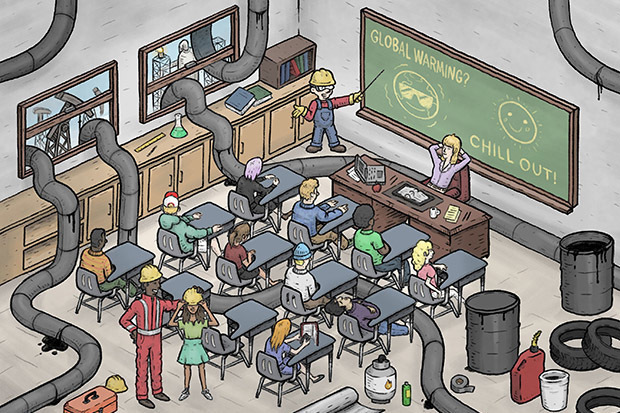 "I don't have any problem with teaching children about oil and gas, but there's nothing in the curriculum that talks about the downsides," Kim Bartlett of Sierra Club's Cimarron Group says. Bartlett says emphasizing renewable energy in state lesson plans could pay off environmentally and economically. "We need to be looking towards the future," she says. "I'm concerned that we're training the workforce of yesterday versus the workforce of tomorrow." Industry involvement in public education is not new. As early as the 1940s, the industry's largest and most powerful lobby group targeted K through 12 schools as a key element of its fledgling marketing strategy. By the 1960s, the American Petroleum Institute was looking to shake its reputation as a "monopoly which reaped excessive profits" and set out to cultivate a network of "thought leaders" that included educators, journalists, politicians and even clergy, according to an organizational history copyrighted by API in 1990. The idea caught on. Hundreds of oil-and-gas-centric lesson plans are now available at the click of a mouse. The children of Oklahoma are getting a raw deal — they are getting educationally ineffective materials teaching content that will be of little use to them if they want to leave the state. Like, Petro Pete's Big Bad Dream. "Having no petroleum is like a nightmare," the online book explains after Petro Pete wakes up from a terrible dream where he had no toothbrush, comb or other everyday items because there's no oil in his dream. Melinda Anderson, a sixth grade science teacher in Oklahoma (who's not related to Charles Anderson), says she was initially hesitant to adopt the lesson plans. She's not originally from Oklahoma and was unfamiliar with the energy industry that was funding it. "I was a little bit concerned the first time because I thought I was going to be influencing my kids one way or the other," Anderson says. But she says the program is "a non-biased curriculum – it's informational." Also, once Anderson and other teachers complete the energy education training, the board pays for field trips — as long as the destination is focused on oil. "The kids get so excited to shout all the information they know that they've learned from all the activities," she says. The program offers another bonus: A heavy plastic tub stuffed with $1,200 worth of supplies and lab equipment. That's prized material in one of the most cash-strapped school systems in the country.